I has a wonderful first stay at the Rustler with friends and relatives. I have stay d in a huge variety of places over forty years and know what really makes a lodge work for me. First and foremost, the people who works there are wonderful. They do everything in their power to make you feel welcome. Probably because they clearly enjoy their work and like their fellow employees, and are well treated and appreciated by management. They uniformly have a ridiculously friendly attitude, making all encounters pleasant and helpful, patiently answering every conceivable question. Without this aspect, even the best-equipped outdoors lodge can be a grim affair. The attitude of the people who work there also likely reflects the fact that they and guests have every resource to work with right on site: a ski shop that took the time to give me the best fit I’ve had in years, on site lift tickets, on site ski school sign up, ski out to slopes and return chair lift with equal access to both sides of Alta, an outstanding restaurant with a lavish and delicious breakfast and dinner included in the room price, free cocktail and snacks (good ones) hour, a day spa with world class masseuses (Jeannie and Amy come to mind), indoor and outdoor hot tubs, eucalyptus steam room, outdoor pool, and - yes - live animal shows and end of day s’mores for the kids. The overall...I has a wonderful first stay at the Rustler with friends and relatives. I have stay d in a huge variety of places over forty years and know what really makes a lodge work for me. Ill be honest, I was a little hesitant to book this hotel given the steep prices here. Based on the pictures I saw online, I couldn't see what justified the high cost of the rooms. But I'm so glad I decided to stay at Alta's Rustler Lodge. From the service to the food to the amenities, all exceeded my expectations. 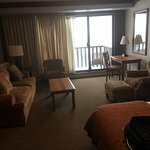 I stayed in a Deluxe King Wasatch Room w/balcony, it was spacious and had a comfortable bed and nice seating area. The bathroom was a bit small, but was nicely appointed and had an extra sink. The food was fantastic and included in the price of the room. The staff was warm and welcoming. There's also a super convenient ski/rental shop inside the hotel. 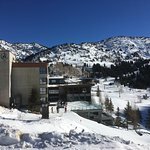 It was my first time to Alta and I would definitely return! Thanks Rustler Lodge for a wonderful stay.